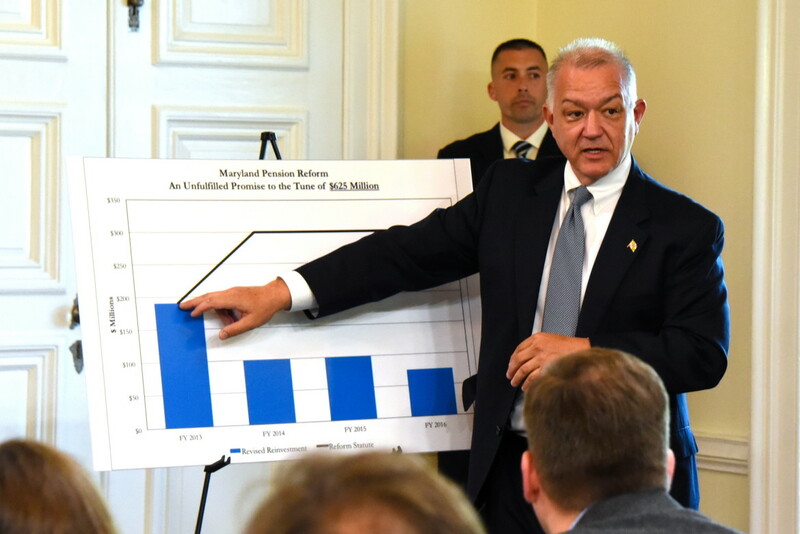 For Maryland’s 388,500 state workers and teachers — active and retired — interpreting the pension news these days is confusing business. Item: Over the past 12 months, the state’s pension fund gained 2.68 percent on its investments. On June 30, the fund’s market value stood at $45.8 billion, a gain of $400 million over the prior fiscal year. All well and good. But the state failed to come close to hitting its investment target of 7.65 percent. That’s not so good. Welcome to the fuzzy world of actuarial pension and retirement funding. Depending on the statistics and the way they are manipulated, your retirement accounts may be in fine shape or in the toilet. Since the media loves bad news, headlines routinely give prominence to the state’s unfunded pension liabilities of nearly $19 billion. What’s not headlined is the slow progress being made in reducing that actuarial shortfall or the misleading way that number is bandied about. What needs to be kept in mind is that pension investing has an extended timeframe. That applies to the state retirement fund as well as folks contributing to their IRAs. Over the past five years, the state’s investment returns have been darned good, raising the market value of its holdings from nearly $32 billion to nearly $46 billion. That’s an annual average rise of 9.4 percent. Yet good times don’t last forever. And they didn’t in the last fiscal year, with stock markets delivering an uneven performance. That downer has persisted into this year, too. The moral is not to get caught up in year-to-year market reports and investment reports. As long as returns are heading upward by a decent amount over the decades, things will come out all right in the end. What worries critics of the state retirement fund is that the program falls far short of being fully funded. That actuarial ratio stood at roughly 69 percent last year (or 72 percent if you look at the fund’s market value). Here’s the catch: The state doesn’t need to be fully funded today. It has ample reserves to write current pension checks to former teachers and state workers. The rest of its IOUs will come due in the years and decades ahead as the fund’s active members start to retire. Some will do so soon but the bulk of active teachers and state workers will be at their jobs for one, two or three more decades. The retirement fund has plenty of time to accumulate the dollars needed to write those future checks. Pension reforms instituted belatedly by the General Assembly in 2011 are now kicking in. This means higher contributions from active members, a less generous pension plan for newer workers and an increase in what state government pays into the pension fund each year. Past and present legislators, though, often tend to play games with the state’s annual contribution to the retirement accounts. Sometimes they re-write the law so they can adjust the state’s payment by $50 million, $100 million or more to bolster a favored program or balance the budget. Governors over the decades have been known to play that game, too.